What Are the Benefits of Wheat Germ Oil for the Hair? If you want to help reverse some of the damage you inflict on your hair, nature has some potential solutions. Consider trying a natural oil such as like wheat germ to help replace some of the lost moisture and possibly help prevent future damage. Apply wheat germ oil topically rather than ingesting it for its hair benefits. If you have a severe wheat or gluten allergy, wheat germ oil may not be right for you. 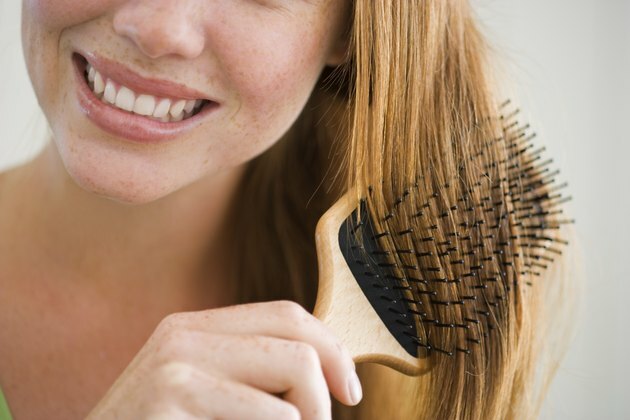 Dry hair can lead to splitting and breaking, not to mention frizziness and static. Your scalp secretes oils to moisturize your hair, but this oil tends to build up around the scalp. If you have long hair, the roots may be oily, but the rest of your hair can be dry and brittle. You can use wheat germ oil, which is comprised of long-chain fatty acids that give it emollient properties, to relieve dryness and add softness and moisture to your hair. It can be used in treatments and hair masks to condition and soften your hair, particularly if you frequently use heat or colorants. Wheat germ oil contains an array of vitamins, including vitamin E. Vitamin E, or tocopherol, is well-known for its skin benefits and is easily absorbed into the skin and hair. The site states that vitamin E can potentially help to promote skin cell formation. However, it is highly moisturizing, which makes it an ideal addition to shampoos and conditioners. The vitamin E content also keeps the oil from becoming rancid; thereby increasing a cosmetic or hair care product's shelf life. Wheat germ oil also contains a polyunsaturated fat called squalene. According to a January 2009 study in "Molecules," shark liver oil is the richest known source of squalene, but plant oils such as wheat germ have been found to contain it as well. Squalene is the main component of skin surface polyunsaturated lipids, making it close to the actual oil your own body produces. This type of oil is readily absorbed by skin cells and hair, and is already being used in cosmetic products. Wheat germ oil also contains a host of B vitamins: B1, B2, B3 and B6. Although the oil will not be ingested, B vitamins are readily absorbed through the skin. They may help to increase circulation to your scalp; some companies use a B complex to help thicken hair. B vitamins are needed by the body for cell and tissue formation, particularly blood and nerve cells. Vitamin B6 also plays a role in the incorporation of L-cystine into hair cells. The "Journal of Dermatological Science" in June 2006 featured a study that showed how alopecia in rats could be averted with L-cystine and vitamin B6 supplementation.